Lomachenko, the next Commey casualty? After Richard Commey’s performance Saturday night, Anthony Crolla probably looks like a more attractive next opponent for Vasiliy Lomachenko’s handlers. England’s Crolla is the mandatory challenger for Lomachenko’s WBA world lightweight title. 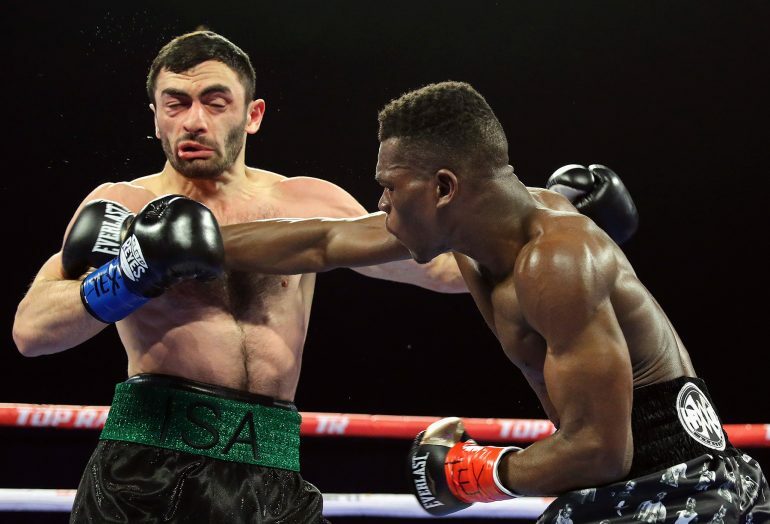 The reason Richard Commey was placed on an ESPN card Saturday night at the Dallas Cowboys’ practice facility, however, was to showcase the Ghanaian lightweight as a potential opponent for Lomachenko’s next fight. Commey (28-2, 25 KOs) exploited that opportunity about as emphatically as he possibly could at Ford Center at The Star. The hard-hitting Commey knocked down Russian southpaw Isa Chaniev three times and stopped him in the second round to win the vacant IBF lightweight title. Referee Laurence Cole halted the action 39 seconds into the second round. His impressive victory should move Commey into an April 12 fight against Ukraine’s Lomachenko (12-1, 9 KOs) somewhere in the Los Angeles area. Because Saturday’s fight was so short, Commey might not have much difficulty making a quick turnaround to challenge Lomachenko in a little more than two months. Commey mentioned, though, that he hurt a knuckle on his right hand in the first round Saturday night and needs an X-ray to make that determination. The 31-year-old Commey captured the IBF 135-pound championship Mikey Garcia gave up late last year to pursue a March 16 fight against IBF welterweight champ Errol Spence Jr. at the Dallas Cowboys’ AT&T Stadium in Arlington, Texas. His win Saturday night also enabled Commey to win the IBF lightweight title he believes he earned in September 2016. Commey dropped a split decision to then-unbeaten Robert Easter Jr. in that fight, which also was contested for the unclaimed IBF 135-pound championship in Reading, Pennsylvania. The first round of the Commey-Chaniev clash was action-packed. After trading punches for most of it, an overhand right by Commey knocked Chaniev flat on his back with 29 seconds left in the opening round. Chaniev got up, tripped up Commey several seconds later and made it to the end of the first round. Commey promptly attacked him as soon as the second round started. He drilled Chaniev (13-2, 6 KOs) with a perfect left hook that dropped him again just eight seconds into the round. Chaniev reached his feet again, but Commey cracked him with several more punishing punches. Cole stepped in to halt the action as Chaniev was falling to the canvas for the third time in the fight. A left-right combination floored Chaniev for the third time.